TORONTO – Sunpan Modern Home has been selected by Corus Entertainment to be the exclusive on-set furniture provider for a series of its television programs, a move the contemporary furniture resource believes will generate nation-wide media exposure. The partnership was launched during the recently concluded 2017 Toronto International Film Festival (TIFF) as Sunpan provided furniture for the ET Canada TIFF lounge. 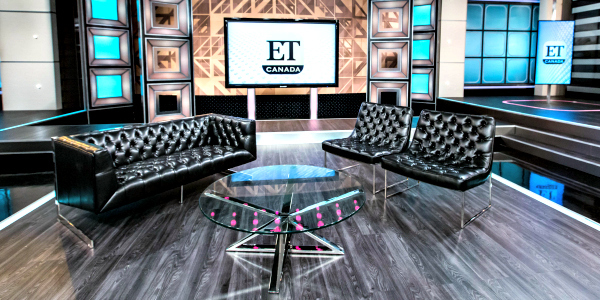 Hollywood talent sat alongside ET Canada hosts on its Viper sofa and armchair. Other pieces that furnished the set included a sleek Allister end table and Gotham coffee table. As ET Canada launched a new prime time television season this fall, Sunpan was also on hand to elevate and reinvigorate the set. On-set furniture includes the Viper loveseat and Toro chairs, Allister coffee table and Stafford adjustable stools. Tsoi believes these Sunpan pieces align with the show’s A-list celebrity glam while offering stylish comfort. ET Canada airs weeknights on Global TV at 7:30pm Eastern. Another set that Sunpan has already furnished is the Bachelor Canada After Show. The program follows Bachelor Canada where hosts and guests discuss Chris Leroux’s journey to find love. The on-set pieces seen on TV include the Matisse sofa and armchair, and Cielo coffee and end tables. The Bachelor Canada After Show premiered on October 11 and will run every Wednesday at 10:30pm Eastern on the W Network until December 6.